Yesterday’s post asked whether NFL would come to mean No Fans Left. I will not rehash the contents except for two items. First, it is illegal not to stand with hand on heart for the national anthem. That makes President Donald Trump wrong when he says it is permissible to stand with arms locked with the guys next to you. So there. Case closed. Let the police arrest all the miscreants on the field. That would be much more interesting than their stupid ball game. Over the past 48 hours, I have read numerous comments online asking for an explanation of the protests since 2016. Slavery? Inequality? Trump? In yesterday’s post, I singled out the Dallas Cowboys and the Pittsburgh Kneelers’ Alejandro Villanueva for doing the right thing. In the Cowboys’ latest game on Monday, September 25, 2017, they tried to please everyone by kneeling before the national anthem was played, then standing with locked arms for the anthem itself. Terrible — and, as mentioned above — illegal. Apparently, this was to show solidarity with all the other teams in the latest kneeling and arm-locking protest: disapproval of Trump’s criticism of their disrespect of the national anthem. Life long Cowboys fan here. I was sick to my stomach and turned it off. I am completely done. I can’t believe it. I really thought they were going to pull through. No more NFL for me. I’m in shock. urged the team’s Leadership Council to stay true to that long-standing practice. Tom Landry must be rolling in his grave. On Sunday, the only Pittsburgh Steeler to go out and salute the flag was Bronze Medal recipient Alejandro Villanueva. I wisely did not show his picture which was all over the Twittersphere. On Monday, the retired US Army Ranger apologised for doing the right thing, saying he made a mistake and is ’embarrassed’ every time he sees that photo of him showing up, standing and saluting for the national anthem. The rest of his team were in the locker room. I’m embarrassed for him. Why could he not stand up to his coach, his team-mates and the NFL? It’s not as if these guys are being paid peanuts and he needs the job. Most NFL ticket holders have to fit the cost of admission, team regalia, car parking, refreshment and so on into their annual family budgets. Most NFL ticket holders are on average incomes. Also think of the hundreds of millions of additional dollars in sponsorship contracts. The NFL is a non-profit organisation that relies heavily on taxpayer subsidy. the legislation wasn’t a big deal 47 years ago. In fact, the NFL had already been classified as a non-profit organization as early as 1942. It’s just that that status only became codified in 1966. Litigator Andrew Delaney has alleged that the NFL uses its non-profit status to launder money. As a trade association that promotes the interests of its 32 for-profit franchises, the NFL sells lucrative licenses for such things as apparel and television contracts through for-profit business such as NFL Enterprises, LLC. The individually-owned franchises receive compensation and, in turn, make annual “dues and assessments” to the NFL, all of which is tax-deductible. The money just goes around in a circle. More important to the NFL business strategy, however, is the big-time television contracts. At the time Public Law 89-800 granted the NFL a monopoly on its broadcasting rights, cable television did not begin to approach the immense revenue it generates today. ESPN and the NFL Network did not exist; it was regional channels that were important. Thus, in 1966 the NFL received antitrust-exempt media rights with little to no opposition. Now those rights are worth billions of dollars annually. What makes these contracts so profitable, however, is the relatively low overhead costs. Thanks to John Q. Taxpayer, team owners receive the lion’s share of those contracts while only making a minimal contribution, if any, to the stadium the game is being played in. Thus, the dirty secret behind why professional football is so profitable is because most stadiums are publicly funded. Teams pay a modest rent to perform in their stadiums, but they retain the exclusive right to air those games on televisions. Those rights are then pooled among the 32 teams and sold to the highest bidder. As the ink dries on the NFL’s highly-lucrative broadcasting contracts, states facing major budget cuts continue to throw taxpayer money at NFL teams. Annually, “NFL stadium subsidies and tax favors add up to perhaps $1 billion.” In addition to these taxpayer contributions, “many cities, counties, and states also pay the stadiums’ ongoing costs, by providing power, sewer services, other infrastructure, and stadium improvements.” Essentially, franchise owners are having their product bankrolled by the public. In order for there to be a meaningful change, two changes need to be made. First, Section 501(c)(6) is amended to no longer include the “professional football leagues” language. Until the NFL is more transparent with its finances, it does not deserve its tax-exempt benefits from being a non-profit organization. Second, Congress must enact legislation prohibiting the privatization of television images performed in publicly funded stadiums. Only with the threat of losing their television contracts worth several billion dollars will the NFL be inclined to privately finance their own stadiums. Such a drastic measure would prevent the public from being gouged for the construction and maintenance of stadiums that serve as the playground for the uber rich. It is time the taxpayers quit subsidizing protest on big boy playgrounds. I believe in the right to protest but, not at a taxpayer subsidized sporting event. Do it on your own time. There are plenty of disabled children, elderly and veterans in this state that would appreciate the money. I think President Trump is angry because the NFL receives taxpayer money to promote the military. In 2009, Barack Obama’s Department of Defense began paying hundreds of thousands towards teams in a marketing strategy designed to show support for the troops and increase recruitments. The NFL then required all players and personnel to be on the sidelines during the national anthem, in exchange for taxpayers[‘] dollars. Prior, the national anthem was played in the stadium but players had the option of staying in the locker room before heading out to the field. Furthermore, teams that showed “Veteran’s Salutes” during games were paid upwards of $5.1 million dollars. You know President Trump is ready for kick-off. No wonder the NFL’s up in arms. They’re afraid he’s going to stop that gravy train. I hope he does. I have many, many more links on the NFL and hope to write about them if I have time. It showed an elderly man picking up an American flag lying on the sidelines during a high school football game. For my readers who are not American, Old Glory must never touch the ground. That used to be taught in school. No longer, it would seem. Their coach and the school should talk about the importance of the flag at a mandatory hour-long class assembly. I realise this desecration is being done because of a certain trendy, yet ignorant, professional football player whose name will never appear on my site. Why anyone gave him the oxygen of publicity I will never know. Said football player could not find a team to sign him for the 2017-2018 season. Good. Unfortunately, he is sitting pretty. I heard one report that he is already worth over $200m. Also sad is that his legacy of disrespect for the national anthem has continued into the current NFL (National Football League) season. The only two teams who have told their players to stand for the national anthem are the Dallas Cowboys and the Chicago Bears. The Cowboys issued a directive several months ago. The Bears did so just before last weekend’s game. I’m not an American football fan. I personally know what dimwits some of the college players were in the 1970s — race immaterial, because many were white. I would like to see today’s guys — college and professional — play in Rugby Union or Rugby League. Those bumper stickers I used to see in the 1980s about having leather attributes to play the game are 100% correct. Rugby players are also consummate gentlemen. President Donald Trump is sick and tired of these political, anti-American gestures. He said so on Thursday, September 21 at a political rally in Alabama in advance of a special senatorial election there. Trump told us "that's ok" that his friend Bob Kraft disagrees with him on NFL players kneeling. "I want him to do what he wants to do." That’s right. Trump is not going to tell his good friend Kraft or anyone else what to do or think — however, they will have to accept the consequences of their actions. Trump will sit back and watch. Now back to the team protests. This isn’t the 1960s. There is no reason to legitimately protest against the United States for discrimination. All of it, starting with the Voting Rights Act of 1965, has been gradually legislated out of existence over the past 50+ years. As for police brutality, minorities are many times more likely to be shot and/or killed by other minorities — civilians. The Jacksonville Jaguars and Baltimore Ravens are in England today for a game in London. When the U.S. National Anthem was played both teams disrespected the USA and yet stood up for the U.K National Anthem ‘God Save The Queen’. Think about that. The NFL, writ large, is nuts. They’ve lost their minds. The NFL players, managers, league officials and owners, along with downstream sport punditry and networks, obviously think virtue signaling their collective unity plays well -mostly in their echo-chamber because of the support from left-wing media- but outside their bubble they are destroying their own business model. Watch what happens. Yep. And the NBA (basketball) and MLB (baseball) are starting to do it, too. Most importantly, Jones mentioned an excellent video about The Star-Spangled Banner, which Francis Scott Key wrote. I did not know the full history as shown below. This is because sport is entertainment, not a political forum. People attend sporting events for a break from the dismal reality of life, including politics. Yet, the NFL owners and managers are angry with Trump. Trump, they say, should keep his mouth shut. But the NFL started it all by protesting, right? We're hearing that Cleveland Browns fans have requested that the team doesn't come out onto the before or after the national anthem. Ironically, although most teams refused to stand for the national anthem — including the Pittsburgh Steelers, excepting Alejandro Villanueva, the veteran who saw three tours in Afghanistan — Sunday, September 24 was Gold Star Mother’s and Family’s (sic) Day. Since 1936, the last Sunday in September has been Gold Star Mother’s Day. On Saturday, September 23, the president expanded this to include families. The display marked a tumultuous weekend between the NFL and Trump, who called the players kneeling during “The Star-Spangled Banner” disrespectful. Trump took note of the incidents at the start of the games on Sunday. Contrary to what some on social media are saying — one example — there is no NFL rule on players’ conduct during the national anthem or when the flag is present. Atlanta’s NBC affiliate has also checked the rule book (as have I). Whilst there are rules about players’ physical appearance and attire — and making or gesturing statements — there is nothing about the national anthem. Now, one could argue about gestures and statements. Remember that Tim Tebow was censured for dropping one knee in thanks for making a touchdown. Also recall last year that players who war 9-11 ‘Never Forget’ footwear on the field were similarly censured. Many think the same judgement should be applied to this current lot of players. There is a military element to this, too. Meanwhile, I’m contemplating the real possibility that NFL will come to mean No Fans Left. Maybe the Pittsburgh Steelers will be known as the Pittsburgh Kneelers, too. Poetic justice. Parents might be surprised to find that a number of athletes still smoke tobacco. Caution should be exercised when pointing out to children that athletes are good, healthy-living role models. In fact, an increasing number of American athletes smoke dope. More on that tomorrow. 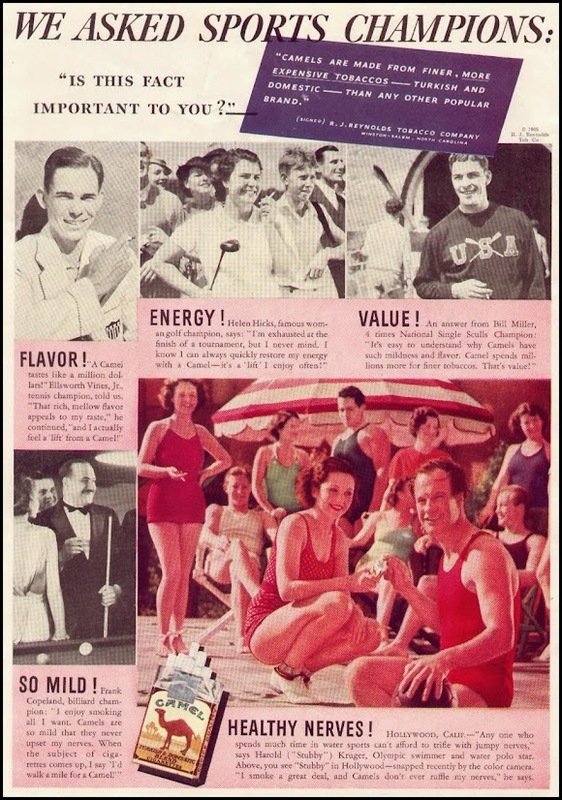 For now, let’s explore the history of athletes and tobacco, past to present. This vintage Camels ad features a number of sports personalities at the top of their game in the middle of the 20th century. To see a larger image, visit South Florida Filmmaker. Ellsworth Vines Jr was a champion tennis player. As an amateur, he won Wimbledon in 1932. In 1934, he began playing professionally and was the leading pro player until 1938. In 1942, he became a professional golfer and won three tournaments between then and 1951. Vines died in 1994 at the age of 82. Helen Hicks was one of the first women professional golfers. She won the 1937 Women’s Western Open and the 1940 Titleholders Championship. She married Whitney Harb in 1938 and competed as Helen Hicks Harb until 1948. In 1950, she and 12 other women founded the LPGA. Hicks died in 1974 at the age of 63 from throat cancer. Harold ‘Stubby’ Kruger represented the United States in swimming at the 1920 Olympics in Antwerp. He was also a water polo star and friend of Johnny Weismuller. After their athletic careers ended, Weismuller went on to play Tarzan in 12 films and Kruger pursued a long career as a Hollywood stunt man. He died in 1965 at the age of 68. In 1986, he was inducted into the International Swimming Hall of Fame as a ‘pioneer swimmer’. Another athlete advertised Lucky Strikes in the 1920s, legendary tennis ace Bill Tilden, who won 138 of 192 amateur tournaments between 1912 and 1930. He won Wimbledon, his last major title, at the age of 37 in 1930. He turned professional after Wimbledon and went on to tour with a select few fellow players until 1945. He died in 1953 at the age of 60 from heart complications. He was inducted into the International Tennis Hall of Fame in 1959. Many tennis fans consider him as one of the greatest tennis players of all time. Incidentally, he played his closest rival Ellsworth Vines Jr six times in the latter half of 1934 and lost each time. he is said to have started the day with a fry-up, a cup of tea and a cigarette. who, according to legend, “could not last the nine laps of a three-mile race without a cigarette and had a friend standing by with one ready for a quick drag before the bell”. In the middle of the 20th century, legendary baseball player Joe DiMaggio appeared in Chesterfield adverts. Golfer Arnold Palmer smoked L&Ms on the fairway. Proof, if any, that smoking a lot does not stop you becoming one of the world’s greatest footballers. As a manager, Cruyff went on to make Ajax a powerhouse in the 1990s. His coaching methods injected new life into FC Barcelona. Some sports fans think that their heroes abhor tobacco. Although many do — and some have turned to drugs — there are still a few traditionalists around. 145 test matches, 194 ODIs, over 50,000 balls bowled on an international stage. Oh yeah, 1,000 international wickets too. took over 1,000 wickets across all first-class cricket, and his personality, trademark behaviour and “great control of flight” when playing made him a popular sports personality. I saw him on television a few weeks ago (C4’s At Home with Steph and Dom). He was puffing away quite happily. playing a single set against each, beating Serena 6–1 and Venus 6–2. In 2000 she admitted enjoying a smoke to wind down telling a French newspaper: ‘My smoking has nothing to do with my tennis. Tim Henman also smoked at least occasionally during his career. He was very careful to keep it secret. Goliath published an article last month: ’10 Athletes You Didn’t Know Smoked’. been seen and criticized for smoking on holiday, proving that when you are a household name, your every move will be watched and scrutinized. of course, smoking is strictly prohibited. is known to smoke heavily during the off-season, and his friends claim that he will chain smoke cigarettes whilst on vacation. He does, however, still smoke around 40 cigarettes a day. The 49-year-old very recently collapsed whilst playing in a tournament in Mississippi on the 18th hole, and this was due to a collapsed lung from a rib injury he suffered in 2007. In typical John Daly fashion, he returned to the course the next day and was even spotted smoking a cigarette on the clubhouse patio. Although not exactly a positive role model for kids, Daly is a fan favorite due to his attitude and his non-country club appearance and lifestyle. is also a cigar smoker, and will often be seen lighting one up after an impressive performance. is also a cigar aficionado. This is not something that he has picked up since retiring either, as he would also smoke a cigar before every single home game to relax. There are not many players that could get away with doing something like this, but “His Airness” is not like most other players. His first cigar was given to him by Jerry Reinsdorf (Bulls owner) after winning the first NBA title, and he soon fell in love with sparking up. Jordan is not seen too often these days, but when he is he will often be seen with a cigar in his mouth. He has even appeared on the cover of the popular magazine Cigar Aficionado, where he revealed how stepping back from the public eye has allowed him to enjoy himself. Most people consider that Olympians lead the lives of saints. It is unthinkable that any of them would smoke. “I was going to raise it at the chefs meeting and rant and rave but my experience is that in a village some people smoke and you usually find piles of cigarette butts in furtive corners. “It’s a bit of a ‘name and shame’ approach I suppose because these things are right in middle of walkways and people use them to smoke. Ideally it’d be great if they didn’t have them but it is probably a better option than people lurking in odd places. When Mark Todd won his first Olympic gold medal on Charisma in 1984 he nervously dragged on a cigarette as the competition leader, American Karen Stives, took to the showjumping ring. Stives knocked off a rail on the penultimate jump, and Todd took gold. Todd is to compete in his seventh Olympics when the three-day eventing starts next week. Three-time Olympic gold medallist Peter Snell [1960, 1964] used to work for cigarette manufacturer Rothmans. Wiggo seemed happy and relaxed as he enjoyed the balmy evening. Good for him. Tour de France winners often smoked cigarettes in the old days. One of the keys to Bradley Wiggins’ four Olympic golds, not to mention his Tour de France victory, is his lung capacity: eight litres, compared to the average man’s six. Perhaps that substantial natural advantage – inherited from his cyclist father – is why Wiggins was content to partake of a cigarette on holiday in Mallorca this week. He certainly isn’t the first celebrated athlete to relax with a crafty puff. Nor will he be the last! Take a second to take that information in: the smokers, breathing in their deadly, unnecessary and toxic smoke, are physically fitter and healthier, and superior in a sporting sense over the athletes from their country who don’t smoke. Now I am not for a moment suggesting that the smoking is responsible for their being chosen, but clearly it has not hindered them in the slightest. How true. Time to look at all the facts for once.